So, things have been a bit quiet here at The Re-Farmer. 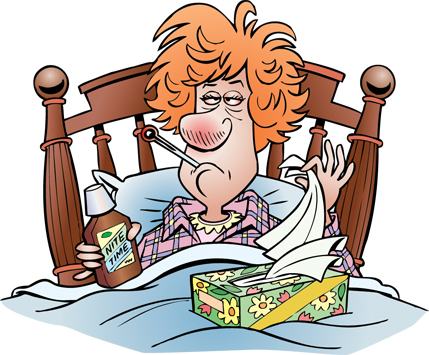 A cold has slowly been working its way through all of us. Even my husband is starting to get it, despite our efforts to keep it away from him. Sick or not, stuff still needs to get done. Today, that included a trip into town. My older daughter, who was the first to get sick and is finally starting to feel better, came along with me, and I’m certainly glad she did. The snowplows have been going by for the past couple of days, which is great for the roads, but as we were leaving through the gate I realized the ridge left behind was too high to drive over. So I walked back to the house for a couple of shovels and an ice scraper, just in case (and by ice scraper, I mean one of these babies (affiliate link)) and we shoveled just enough for the van to get through. Thankfully, it wasn’t packed down into ice walls and easy to shovel. Otherwise, us sickies would have had a much harder time of it!! That done, we just left the shovels and scraper leaning on the gate (which we have not moved from where it was left; after discussing with my older brother, we decided to leave it until spring to fix). Normally, I pull the van through the gate and stop in the driveway to wait for whoever is locking the chain back up. This time, I had to plow through to the road because, even after shoveling, I knew I wouldn’t have the traction to stop and start in the middle of what we shoveled out. Our trip into town was short and sweet; we got what we needed and left, stopping only to get the mail along the way. My daughters got their GST rebates, but I got a letter from Canada Revenue saying that, since they didn’t receive a response from their last letter to me (confirming our move to another province), they’re going to stop payment on something. Which is fine, since it’s a provincial program we don’t qualify for anymore. The thing is, the only reason I’m getting letters like that, and not getting a GST rebate, is because the tax preparer didn’t do my taxes along with my husband’s, because I have no income to claim. Which reminds me; we’re going to have to go somewhere else to do our taxes next year. On top of them not doing our taxes together (my husband can claim me as a dependent) we didn’t even find out what happened with my husband’s disabled tax credit, which should have been retroactive to 2015. Got interrupted while writing this; I got a call back from the company I took the chainsaws we found in the garage to. I left 4 chainsaws with them – 1 electric, 3 gas powered. He was able to fix 3 of them and wanted to know what I wanted done with them. The fourth, the John Deere, required a part that would have cost so much, it wasn’t worth fixing, so he just stopped working on it. Of the two remaining gas powered ones, one is much heavier than the other; good for cutting a lot of big trees. Which, if we were doing firewood, would be useful. But we’re not. Any big trees that need to come down, I intend to hire someone (more because of being close to buildings and whatnot). So I will be taking the lighter gas powered one, plus the electric, which apparently didn’t need much work at all. Of the ones I will not be taking, they will accept them as trade for services. Once that was worked out, he could figure out the bill for me. Getting the two fixed up would have cost me almost $180, but with the trade in’s, it’ll cost me under $130. Plus, I can pick them up whenever I’m ready. Which will be next month. I’m now going to have not one, but TWO working chainsaws to continue cleaning up! I am so excited! That was some much appreciated good news! Getting home today, I stopped on the road for my daughter to get out and unlock the chain, to make sure the van could clear the remains of the plow ridge. I drove into the yard to unload, and when that was done, I drove the van to the garage. I used the snow blower to clear into the yard, but didn’t take into account the wide turn needed to go OUT of the yard, to get to the garage door. I really didn’t think the amount of snow in that little section would be an issue. After it was clear I wasn’t going to be able to get through, I went and got the shovels (they needed to be returned from the gate, anyhow! 😉 ), then shoveled around the van. Just as I was getting out of the van to try and shovel under it as much as I could, my darling daughter came out to help. With her pushing, I was finally able to get out of the deeper snow and park the van in the garage. 1) how much further I will need to take the snow blower, to accommodate wider turns from the yard to the garage door. After parking the van (and remembering to plug in the block heater, just in case we have to head out again, soon), I even remembered to bring the snow shovels and ice scraper back to the house. My daughter had paused to pet a desperately attention seeking Butterscotch, when she pointed something out to me. We were being watched, from above. 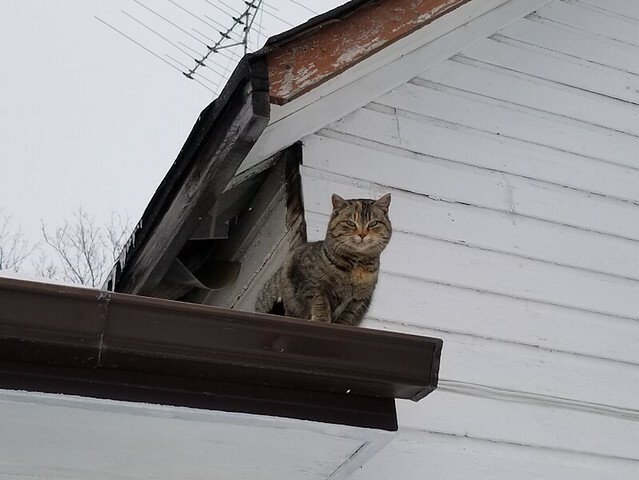 She stayed up there, watching us and meowing her disapproval, the whole time we were outside. Okay. We got the shopping done. The sickies could now go back into hibernation. Except… guess what I forgot to pick up? The cold medication my husband asked for. We were so keen to get done and home as fast as possible, I completely forgot. At least I remembered to get the distilled water for his CPAP. I am not going out again today. Nope. Not going to happen. LOL I love it when she goes under the covers and cuddles. Thanks. We’re working on it! 2am, and all four of us are still up, because none of us can breath while lying down. Not even hubby with his CPAP forcing air in!